A critical feature of episodic memory is the ability to remember the order of events as they occurred in time, a capacity shared across species including humans, nonhuman primates, and rodents. Accumulating evidence suggests that this capacity depends on a network of structures including the hippocampus and the prefrontal cortex, but their respective contributions remain poorly understood. As addressing this important issue will require converging evidence from complementary investigative techniques, we developed a cross-species, nonspatial sequence memory task suitable for behavioral and neurophysiological studies in rodents and in humans. The task (see figure below) involves the repeated presentation of sequences of items (odors in rats and images in humans) and requires subjects to make a judgment as to whether each item is presented “in sequence” or “out of sequence.” To shed light on the cognitive processes and sequence representations supporting performance, different types of “out of sequence” probe trials were used including: (i) repeating an item from earlier in the sequence (Repeats; e.g., ABAD), (ii) skipping ahead in the sequence (Skips; e.g., ABD), and (iii) inserting an item from a different sequence into the same ordinal position (Ordinal Transfers; e.g., A2CD). 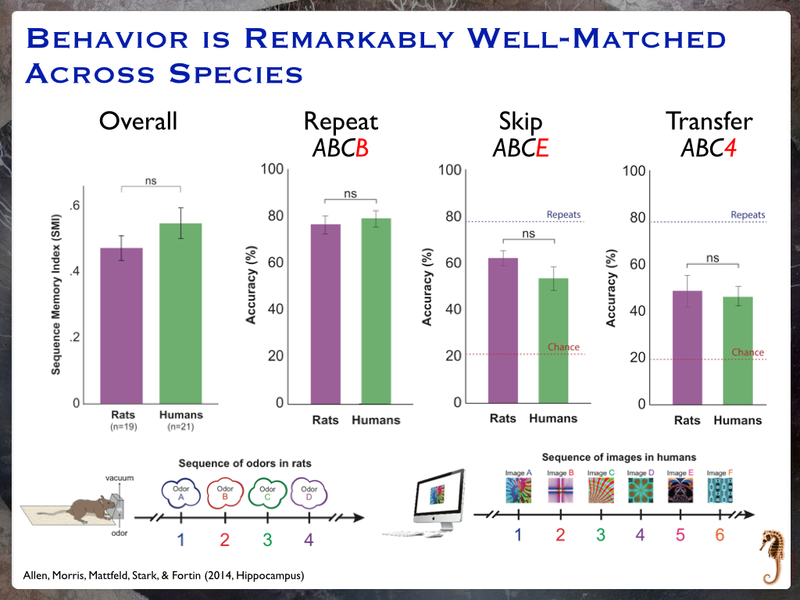 We found a remarkable similarity in the performance of rats and humans, particularly in the pattern of results across probe trial types (see results figure below). Thus, the results suggest that rats and humans not only remember the sequences of events, but also use similar underlying cognitive processes and mnemonic representations. This strong cross-species correspondence validates this task for use in future basic and clinical interdisciplinary studies aimed at examining the neural mechanisms underlying episodic memory. We are pleased to collaborate with Norbert Fortin and Tim Allen on this joint project.